Shruti Haasan is known for her agile dance moves. She is currently in Los Angeles shooting for Sabash Naidu - the trilingual with her father Kamal Haasan. 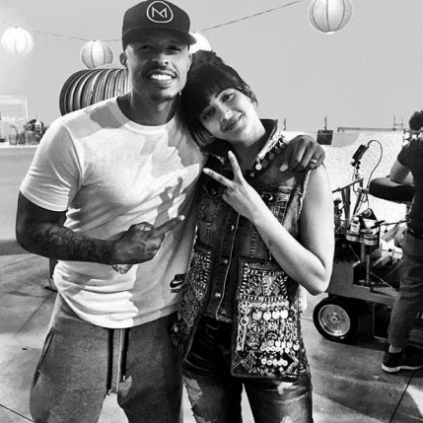 Shruti will be seen dancing to the steps of none other than the Step Up series choreographer Jamal Sims for a special song in the film. The song is believed to be focused on Shruti's character and is promised to be one of the most incredible dance songs that will be on screen in recent times. Says a source from Shruti’s camp, "A true blue fan girl, Shruti has been very excited about working on this film being one of her dad's biggest admirers. She plays Kamal Haasan's character's daughter in the film, who is extremely smart and stylish. For a dance number picturized on Shruti, the team has brought on board Jamal Sims - who's known to be one of the best dancers and choreographers in the hip hop and street dance forms. Shruti apparently rehearsed with Jamal and his team with a lot of fervor, despite being a terrific dancer herself to ensure she got every movement perfectly. They have just about kick started the song shoot and the entire team is looking forward to the end product." Looks like there is plenty to look forward to from the film in addition to the family coming together. People looking for online information on Kamal Haasan, Jamal Sims, Sabash Naidu, Shruti Haasan will find this news story useful.